São Paulo – Brazilian vibrant metropolis, situated on an unusually beautiful surroundings. The town grew up on a high plateau in the midst of tropical forests. Tourists and travelers attracted to the scenic spots of Sao Paulo, as well as interesting sights: museums, parks, etc. Especially lovers of shopping here because the streets of the metropolis you can buy anything you want. Upon arrival, you can not worry about moving around the city if you take care of the pre-registration of the rental car at the airport in Sao Paulo. This can be done even before departure, visit bookingcar.ru. 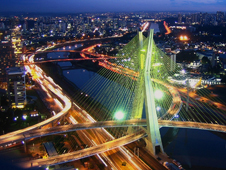 Car rental points are located not only at airports (Guarulhos, Congonhas), but also in the central parts of the city. The same restriction applies to highways - 120 km / h.
For throughout Brazil has a unified legal system, according to which the maximum allowable rate of alcohol in the body is 3.2 DG per liter. In 2008, the government tried to promote a bill to a zero alcohol content, but in practice this is not possible, because even eating sweets with liqueur or brandy affects the performance of the device. Inspectors most serious about the use of alcoholic beverages, and if after a check reveals that the level of alcohol above the specified standards, the driver will be fined or lose the right. It is even possible imprisonment for particularly serious violations. All of Brazil differs from the usual rule: on certain days of the week on specific roads may not appear vehicles whose number plates end with some number. This is to "unload" runs from too large flow of vehicles. No restriction on the weekends. Renting a car in Sao Paulo, get ready for what he considered the most expensive city in Brazil in terms of roads - there will have to travel to spend the most money. This applies to long-distance routes, for example, from Sao Paulo to Uberaba (500 km). For payment, you can periodically stop near the posts on the road or use a special device that saves all the information on travel, and then invoice. I've organized travels by myself for many times. Usually I prefer Europe with its comfort and quality service. I adore to drive a car. I've found this excellent car aggregator long ago and now I always use it. I've visited many countries. And the site always helps me. It's a very useful resource. I recommend it to everybody!! !